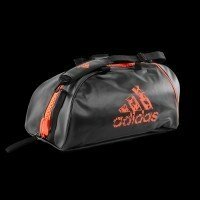 When you've got to get the gear to the game, the durable Adidas 2 in 1 Training Bag is the way to go. Compression straps give your load extra support, while padded handles on top and bottom make traveling with team gear a breeze. • “Big Fly”plastic easy running large zipper top closing. • Screenprinted Adidas brandmark on side, Adidas 3 stripes on the other side. • Can be converted into a rugged backpack.